Just got back from NY. I came across this building in a magazine on the arts in the Hudson Valley. 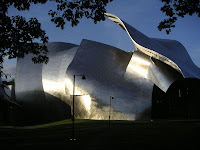 It's the Richard B. Fisher Center for the Performing Arts at Bard College in Annandale-on-Hudson, NY and is designed by Frank Gehry. I have GOT to see this in person when I head back east next month! As Ellen Lampert-Gréaux says in this article, "...it's a lot closer than Bilbao." LOVE the building! Hope your husband is better, too.